Kimi had just 23 events in single-seater cars by the time Sauber gave him an F1 contract. Drove his first 4 F1 races under temporary licens. Left Ferrari at the end of the 2009 season one year before the contract ended. Didn't race the final 2 races 2013 because of a back surgey. 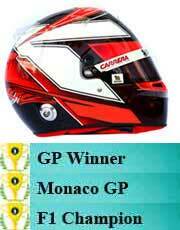 He is the only driver to take a race win in the V10, V8 and the hybrid V6 engine eras.